Tomorrow a few of DTLT’s finest are going to meet with some folks from the History and Historical Preservation departments to talk about the technological possibilities for the emerging Center for Digital History at UMW (nothing official yet!). This is very exciting because we all know the faculty in these programs quite well, and I think that they are genuinely interested in what we have to bring to the table in terms of imagining and planning for such an academic resource center. I guess the benefits of working at a small liberal arts college manifest themselves in moments like these. 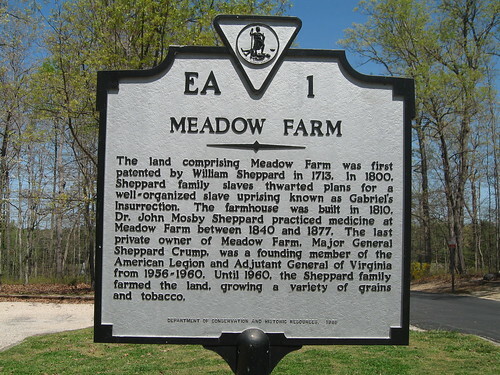 So, by way of a bad transition, my family and I spent the day at a “retired” plantation just North of Richmond in Henrico County called Meadow Farm. This site was the Sheppard family’s tobacco plantation for almost 250 years. The actual museum on the site was underwhelming, and I often find myself intellectually disgruntled by such historical landmarks -especially since the possibilities for learning about the history of such a place is often limited to a few generic placards. I’m not one of those hippies that believes that just because you are on the ground where history took place that by some kind of mystical osmosis you will begun to understand the events -I actually need something to read, conceptualize and interact with (I’m that kind of learner:)). Anyway, the grounds were beautiful and the day was spectacular (blue skies and 85 degrees), but I left wanting a bit more from my experience. I mean Gabriel’s Rebellion, one of the most significant failed slave revolts of the early republic was foiled at this farm by two of the Sheppard’s house slaves -whom soon after were given their freedom. There was very little in the way of dealing with this history -whether by contextualizing it, exploring it, or further examining the history of slavery in the US. In fact, the only place I saw any mention of the slave revolt was in the historical marker at the entrance to the plantation. This day trip to Meadow Farm rekindled an idea I had been bouncing around in my Museum lab class this semester given the ever increasing ease of creating mashups. The idea was quite simple, have a group of students take images of historical markers in Virginia from around the state -just like the one pictured above- and put them into flickr, geo-tag them and create a resource of historical sites that might be used in several different ways. In order to create a more comprehensive resource for the over 1500 historical markers from around Virginia we could open up the project to all UMW students, allowing for a distributed means of collecting the markers quickly and easily. The logic being that we have students from just about every nook and cranny of the state, get them excited about adding to this project by creating a flickr group that would make it easy for them to make their contribution. In fact, this is by no means novel, something like this has already been done in print and online -although the online version is a apparently a one-man 1.0 project. The idea in an educational context would be to open the images up for more conversation around the political, social and cultural events in Virginia’s history, as well as a way to graphically track and interact with more recent and local history. Then, serendipitously, Alan Levine linked to Will Richardson’s post on Google’s My Maps, and I started to see just how much easier and contextualized this process might be. The final push came from Jeff McClurken’s (one of UMW’s finest digital historians) post about a Surreal Mashup Moment which brilliantly illustrates the possibilities for Google’s My Maps to think history digitally in some powerfully interactive ways. So why not create that flickr group of Virginia historical markers and build them into a Google My Maps account (both of which are registered and administered through UMW’s new Center for Digital History). Let the students explore with these tools, let them mash it up, and while they’re at it let them create a dynamic evolving teaching and learning resource that can be used, re-used and abused? 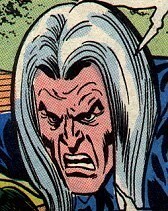 This entry was posted in Uncategorized and tagged digital history, dtltblog. Bookmark the permalink.